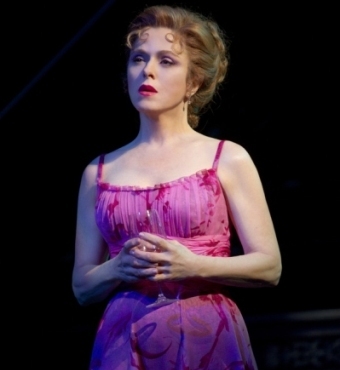 Bernadette as Sally Durant Plummer in Follies on Broadway. I’ve written about Stephen Sondheim many times (maybe most recently here). Invariably, when I think of Sondheim, I think of Sunday in the Park with George. “Our musical.” We don’t have a movie. Or a song. But we do have a musical. And invariably, when I think of Sunday in the Park, I think of Mandy Patinkin and Bernadette Peters, that musical’s great stars. Not that we saw them in it. We were too late for that when we finally did make it to the original Broadway production during our honeymoon, in the summer of 1985. But we’ve listened to them on the cast recording so often that their voices are embedded in our minds. So when we learned that Bernadette Peters would be appearing in concert with the Seattle Symphony this fall, we prepared to buy tickets the moment they went on sale. Which we did. Two nights ago she came. The program consisted of the orchestra playing alone for a very short first-half program, then Peters after the intermission. That first-half program consisted of three great overtures, popular pieces for an evening of popular music: Mozart/The Marriage of Figaro, Mendelssohn/A Midsummer Night’s Dream, and Strauss/Die Fledermaus. Our seats were dead center in row P, which I would imagine is close to ideal acoustic location. Maybe so, maybe not. All I know is that the strings sounded a bit muted, not as vibrant as I would have expected. But the music is great. What’s not to like? Behind every great diva there’s a hard-working, often brilliant musical director. For Bernadette Peters, that man is Marvin Laird. The two first worked together in 1961. He was the assistant conductor and she was a Hollywood Blonde in a national touring production of Gypsy. Long story short: Laird, who moved from Broadway into the endlessly fascinating world of 1970s variety television, helped Peters craft a nightclub act, and they’ve been an inseparable duo ever since. Also joining Peters on stage was Cubby O’Brien on drums and Kevin Axt on bass. O’Brien is famous in his own right, an original Mouseketeer, drummer for The Carpenters on tour (when Karen would sing rather than drum), and drummer to many other stars as well. As the symphony players filed back in near the end of intermission, we had the happy surprise of seeing prominent local harpist John Carrington take the stage. A childhood family friend of Gail’s, he’s not the symphony’s regular harpist, but does appear from time to time. And today he posted a photo on Facebook of himself backstage with Peters. The lights dimmed, Laird walked on in flowing white hair and tails, we applauded, and the music started up. It was in effect another overture. After about three minutes, the house announcer said, “Ladies and Gentlemen, Bernadette Peters,” she strode in from the right, and the crowd went wild. I never saw anything like this at the symphony. For that matter, I couldn’t remember seeing anything quite like it anywhere. I had the feeling that this is what it must be like in Las Vegas. I haven’t been there since I was 14—more than a few years ago—and never went to a show. I can only guess what it’s like seeing the Liza Minellis of the world. But now, when I guess, I’ll recall Peters. Her magnetism. Her control of herself and the audience. Her relaxed comfort with stardom and the knowledge that we would follow where she led. She made the obligatory opening remarks about how much she loved Seattle. I don’t know why we need to be patronized like this, but people seem to enjoy it. And then the music. Lots of Sondheim. A little Rodgers and Hammerstein. Maybe 60%/20%. And a few other songs. Some with full orchestral backing. Some with the band alone, or (in one case) with Laird and the principal cellist. Loud. Soft. Full sound. Intimate sound. Ballads. Anthems. A little of everything. From South Pacific, the song There is Nothing Like a Dame–usually sung by a men’s chorus but in her hands a vehicle to emphasize her own dameness. From Follies, whose revival at the Kennedy Center and on Broadway she starred in two years ago, In Buddy’s Eyes and Losing My Mind. (I own have been listening frequently to the cast recording of this revival, with Peters singing these two songs.) From Carousel, an unlikely choice perhaps, but one that offered a change of pace, When I Marry Mister Snow. From Into the Woods, a song I associate with her, though she pointed out (and I knew) that she didn’t actually sing it in the original production on Broadway, No One is Alone. Here, watch her perform it below, from a concert in London a few years ago. You’ll see that this is the song arranged with just piano and cello. Marvin Laird stands and bows in the closing seconds. Maybe there’s not much point listing all these songs. I’ll just mention three more Sondheim standards that were highlights: Being Alive from Company, Send in the Clowns from A Little Night Music, and Ladies Who Lunch, again from Company. Peters was on for about an hour and a quarter. She went off to thunderous applause, returning to do a single encore, her own composition, Kramer’s Song. I don’t know what to make of the phenomenon of stars writing children’s books. (Do they really write them? And would these books ever get published if written by anyone else?) But whether or not I approve, she writes them, and she wrote this song for one of them. Gail and I were convinced that she was saving up any of several possible Sunday in the Park songs for the end or the encores. She wasn’t. Just the lullaby. And then she was off, as Laird led the orchestra and band in a postlude that left us all hungry for more. I didn’t see anyone leaving until the music stopped and the lights came up. Which reminds me, in contrast to any other orchestral concert I’ve been to, in this one lighting was a feature. A fitting feature, as one would expect in a Broadway show, but another reason I felt more in Las Vegas than in Benaroya Hall. So that’s that. I don’t know when we’ll see her again. She gives the impression that she’s not slowing down, though maybe her voice is. I know many of these songs well enough to recognize when a high note is coming, and I could see her pause as she prepared for each one. She would get close, not always hit them, then drop down a bit once she got there in a way that sounded perfectly musical, even if not accurate. It worked. And anyway, she is so expressive that none of this matters. We couldn’t have been happier. Well, except maybe if she had sung We Do Not Belong Together.